How much of the US could the top 1% buy? If the top 1% of the nation put all of their money into land they would own 40 states. In contrast the bottom 80% of the nation could only afford to own all the real estate in 3 states. All the real estate in the contiguous US is estimated to be worth nearly $23 trillion. The top 1% of US households is estimated to be worth $19.2 trillion. This means that only 1% of the US population could literally afford to buy almost the entire country if it were for sale. These numbers are based on the top 1% by net worth, instead of income. Sources and tables are at the bottom of the page. If you’re curious how close you are to the top 1%, try out the net worth percentile calculator or the income percentile calculator. They are based on a different data set, but the general trends are the same. I filled in the maps starting in the west coast and moved east. I removed states that the 1% couldn’t afford in their $19.2 trillion budget starting with Florida. The 8 states in the contiguous US that weren’t selected are Tennessee, West Virginia, Virginia, North Carolina, South Carolina, Georgia, Alabama, and Florida. 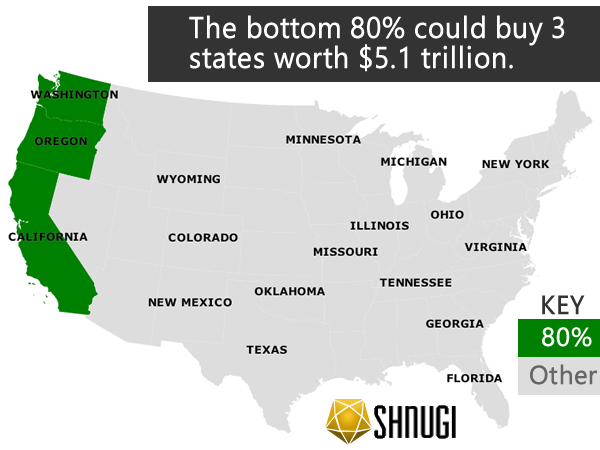 The bottom 80% had a combined wealth of $5.1 trillion, which could pay for California, Oregon, and Washington. I wanted to stay consistent and start from the west coast, so California just based on it’s size and wealth is driving down the number of states.